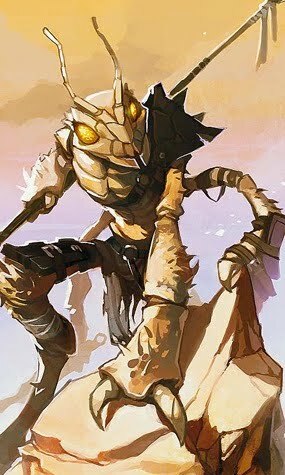 Personality: Thri-kreen or 'Kreen" society is based around nomadic hunting packs, which can boast up to a dozen individuals. Rarely, thri-kreen may form larger, semi-permanent communities if prey is plentiful and if they see they have a reason to. Packs scour hot grasslands and deserts for prey, but are careful to move on before they overhunt an area. They hunt for food almost incessantly, and though they prefer not to eat intelligent creatures, they will do so when in great need; they have a well-known taste for elves in particular. Except when starving, thri-kreen aren't aggressive. scrublands, and savannas of the world, Thri-kreen are near-perfect hunters. Physical Description: Thri-kreen resemble humanoid preying mantises. They stand from six and a half to more than eight feet tall, and are covered with a thick but flexible carapace. Coloration ranges from dusty yellow to brown, so as to blend in with their native deserts and grasslands. Thri-kreen have six limbs; two of these are used for locomotion, and the other four function as hands. Though tall, they're lean rather than massive, and move with surprising agility for their size. Relations: Thri-kreen are reclusive, and prefer not to deal with most other races – thrikreen find them as alien as other races find the thri-kreen, and diplomatic relations often suffer when a hungry thri-kreen pack makes a meal of merchant caravans or lone wanderers. Though mantis warriors don't get along famously with anyone, obviously relations with elves are particularly strained. Religion: Thri-kreen pay lip service (such as it is for creatures without lips) to Calistra. Thri-kreen aren't overly religious, divine classes are never seen among the Thri-Kreen. Language: Thri-kreen speak an Chik'thar, but many understand Common. Chik'thar consists of clicks, chirps, and grinding noises. It's difficult for thri-kreen to mimic humanoid languages, due to the structure of their mouths, and it's equally as hard for other races to speak Chik'thar; however, they can do so with practice. Thri-kreen must spend an additional skill point (per language) to learn to speak any humanoid languages they know, and humanoids must likewise spend an extra skill point to speak the Chik'thar. Names: Thri-kreen names are nigh-unpronounceable in any tongue but their own, but sociable mantis warriors that speak Common or other languages often give pronouncable approximations of their names. Deed names, and those which describe the traits or role of the thri-kreen, serve as the given name, with the surname being the character's pack or tribe. Examples include Far-Leaping-Mammal-Hunter-of-the-Xcaatle-Pack-of-the-Parched-Grasslands, a well-known thri-kreen ranger, and the psychoportive planeswalker Spotted-Milanxle-Once-Member-of-the-Ch'Clxil-Tribe-Now-One-Who-Runs-Alone-and-Spans-Infinite-Distance-by-Her-Will. Thri-kreen take pride in their names, and giving their names to outsiders (non-thri-kreen) is considered an honor; they often take offense at those rude souls who shorten or don't properly pronounce their names. Adventurers: Most adventuring thri-kreen are psychic warriors, psionicists, druids, rangers, or monks. +2 Wisdom, +2 Strength, -2 Cha: Thri-kreen are strong and quick, but they think differently from most humanoids and have a hard time relating to other races. Monstrous Humanoid: Not affected by Charm Person and other humanoid-affecting spells. Land speed of 40 feet. Multiple Limbs: 4-Handed: You have 4 hands and are able to carry multiple things at the ready without the need to switch equipment. However, you may not gain a bonus for having two shields. If you take the feat two weapon fighting and use four weapons you gain a +2 instead of the normal +1. Natural Attacks: 4 claws that deal 1d4 (at full bonus), secondary bite attack for 1d4 (-5 penalty). You can also swap out claw attacks for weapons. Keep in mind that attacking with more than one handheld weapon results in penalties unless you have Multiweapon Fighting (see Monster Manual). Naturally Psionic: Thri-kreen gain 3 extra power point at first level. Alien Nature: Thri-Kreen have a hard time relating to other races and recieve a -2 penalty to any Cha based checks when dealing with creatures or races outside of its own race. Poison Bite: The thri-kreen's bite attack delivers a venom that causes 1d3 Dex damage initially, then 1d3 Dex damage a minute later. DC is 11 + Con modifier. A thri-kreen produces only enough venom for one bite/day. Natural Leaper: Thri-Kreen are natural jumpers. You can make all jumps as if you had a running start. They have a +2 bonus on all Athletics skill checks. Bug Eyes: Thri-Kreen have a pair of large faceted eyes on the side of their head and three smaller eyes on the top of their head. This give them more then 180' vision at any time. They receive a +2 to perception checks. Trance: Rather than sleep, thri-kreen enter a meditative state known as trance. You need to spend 4 hours in this state to gain the same benefits other races gain from taking a 8-hour extended rest. While in a trance, you are fully aware of your surroundings and notice approaching enemies and other events as normal. Thri-kreen are immune to any sleep effects of spells. Thri-Kreen are proficient with all simple weapons, gythka, and chatkcha. Racial Weaponry: The gythka is treated as a melee weapon. The chatkcha is treated as a ranged weapon. Thri-Kreen Average Height: 6' 6" - 7' 6"
Thri-KreenAverage Weight: 350 - 450 lb. Paralytic Bite: damage improves to 1d6 Dex initial damage, paralysis secondary damage. Racial Bonus Feat: You may select one bonus racial feat from Racial Feats below. * Similar to a boomerang, this weapon will return on a miss. Whether above or below you, no enemy is out of your reach. Trigger: You moved at least 2 squares during a jump or fall and are adjacent to the target. Hit: 2W + Dexterity or Wisdom modifier damage. The target is pushed 1 square and knocked prone. You shift into the space the target occupied. Miss: Half damage. Both you and target are knocked prone. Swap out for Naturally Psionic - Gain 3 extra points of ki (such as the ninja or monk classes) to fuel ninja powers, stunning fist attempts, and likewise.